Posted on May 8, 2017 by Barry V.
These days, Endicott Wildlife Sanctuary is best known as home of the Ipswich River Wildlife Sanctuary Nature Preschool. The school operates out of the historic estate house once owned by the renowned Endicott family (John Endicott was the first colonial Governor of the Massachusetts Bay Colony). The sanctuary, which lies within earshot of Rte 128, is small at just 43 acres, and the half mile of trails can easily be explored in a half day or so. Upon arrival, I pass through a small but attractive cattail marsh on either side of the entrance drive. I make a mental note of this, and after parking and studying the visitor’s kiosk, I decide to walk back down the driveway to this marsh. The cattails are in various stages of going to seed. Some are nearly falling apart, with gauzy fragments waving in the light breeze. Others are largely intact, with only small patches turned to cottony fluff. A small movement catches my eye, and I watch a chickadee working over one of the riper heads, tearing away clumps of fiber. Several times, the bird drops a wad of fluff, then dives down to retrieve it from the base of the plants. 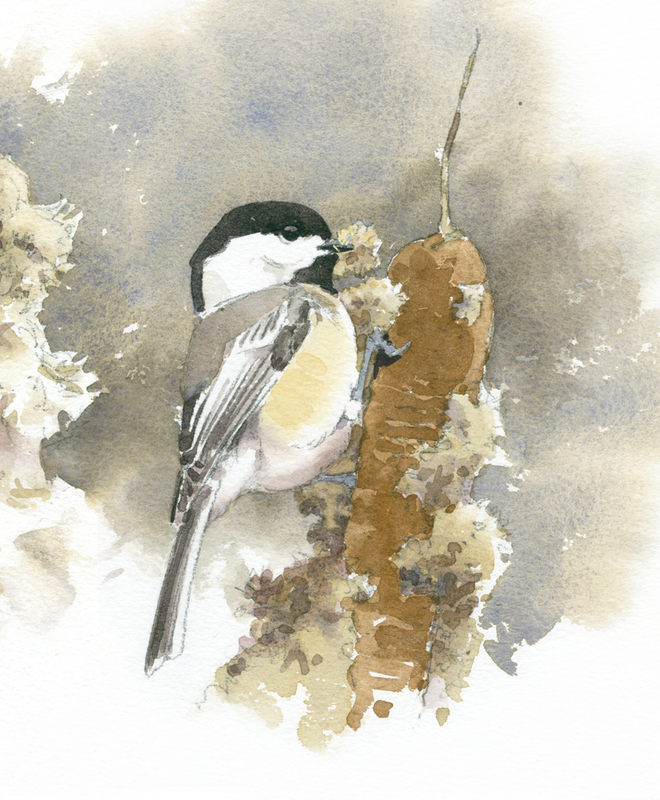 I’m not sure what the chickadees are after, but later I go on-line and find references to Chickadees gleaning both seeds and insect larvae from cattails. Near the entrance to the Ellice Endicott Trail, I pause where a patch of common polypody is growing atop a large boulder. 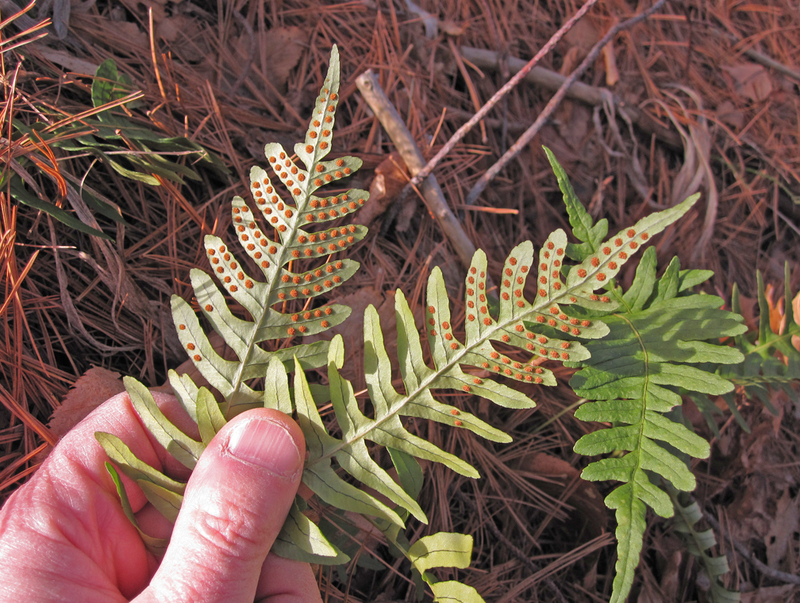 I can’t resist turning the fronds over to examine the regularly spaced dots loaded with spores on the undersides. They remind me of a type of penny candy that we coveted as kids: colored candy dots arranged in rows on a paper ribbon. I wonder if you can still buy the stuff, and if the kids in the nature preschool would know what I’m talking about! The trail passes by a play area where “toys” made from natural materials are spread out on a bench next to a hut built from sticks. 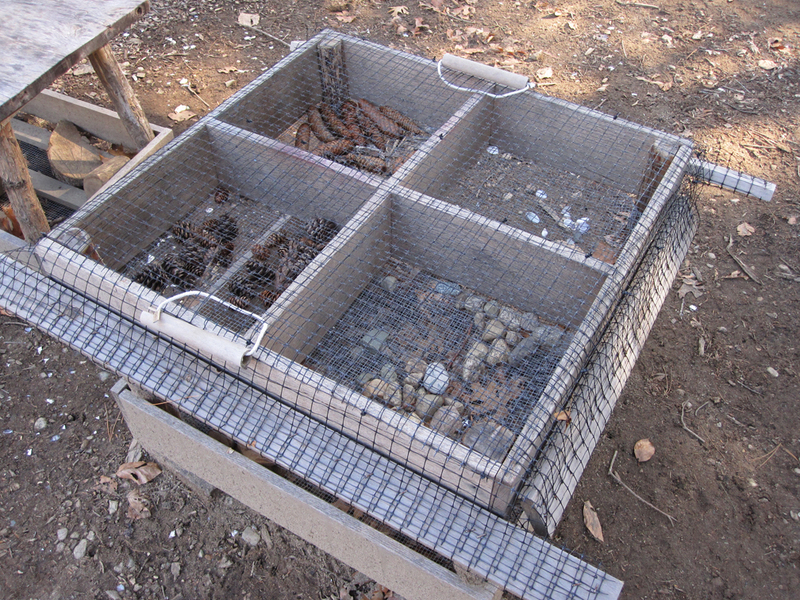 There’s also what looks like a large sieve or sifter, with separate compartments and a cover. I’m not sure what the kids do with this contraption, but I bet it’s FUN! I pass through a mixed forest of mature white pine and red oak, interspersed with hemlocks and beeches. The young beech trees in the understory hang onto their leaves all through the winter. 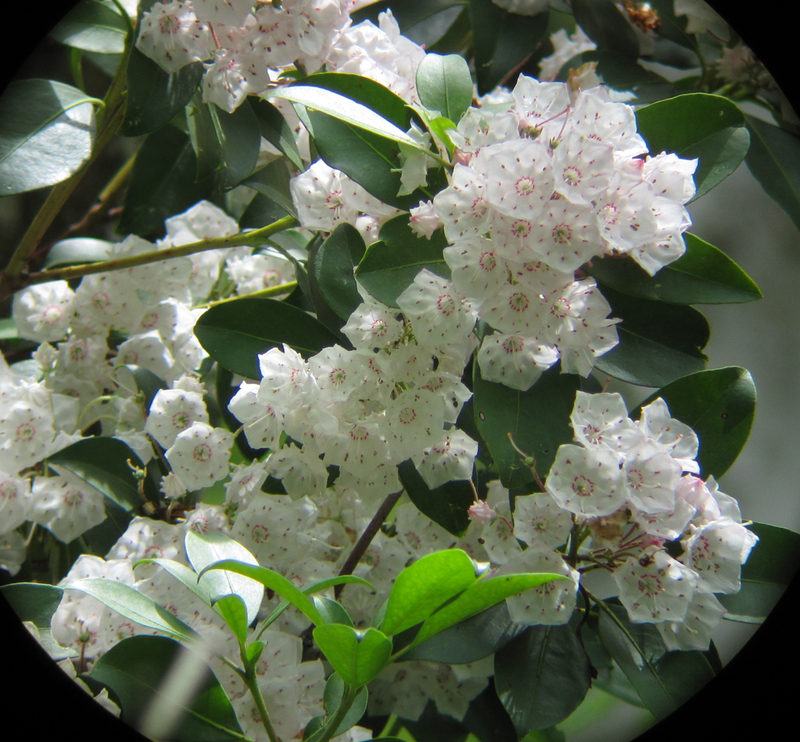 The pale, papery leaves are curled into tight coils and hang in orderly rows from the delicate twigs. 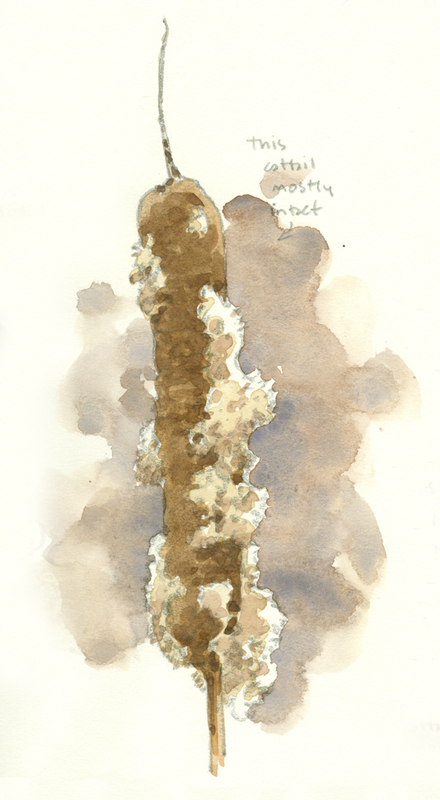 I decide to do a drawing of a particularly attractive branch, then take out my watercolors and add some soft washes of tan. The dorsal surfaces of the leaves are richer in color, and lend an orange glow to the inside of the coiled leaves. 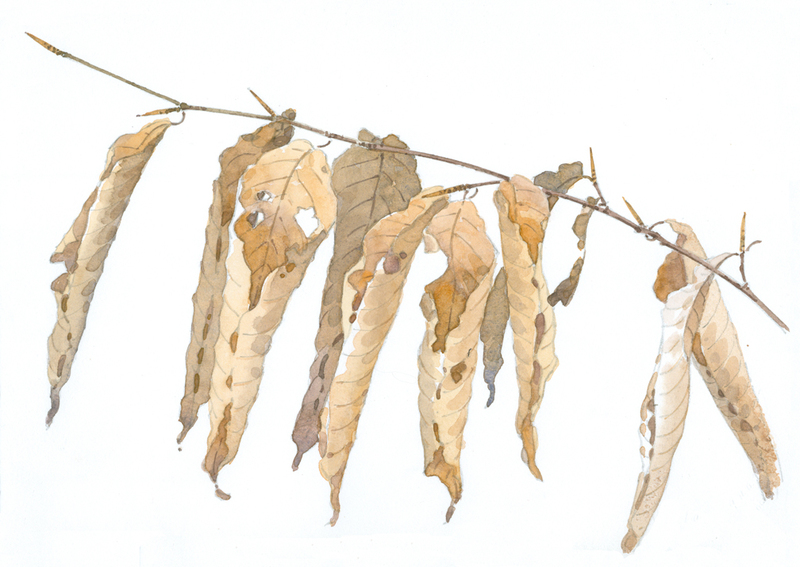 They remind me of ballet slippers – all up on their toes in a delicate dance – so I decide to title the painting Beech Leaf Ballet. 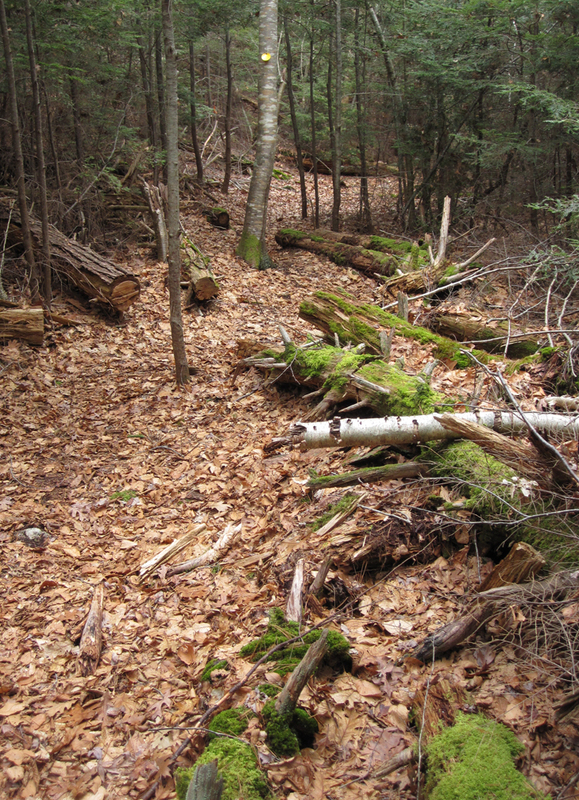 The trail descends into a moist and mossy hemlock gorge, skirts a swampy stream lined with sphagnum, and then leads to a spur trail offering a vantage into the wet meadow. There’s a rich variety of wetland plants here: maleberry and winterberry, sweet pepperbush and arching sprays of rushes out in the middle. 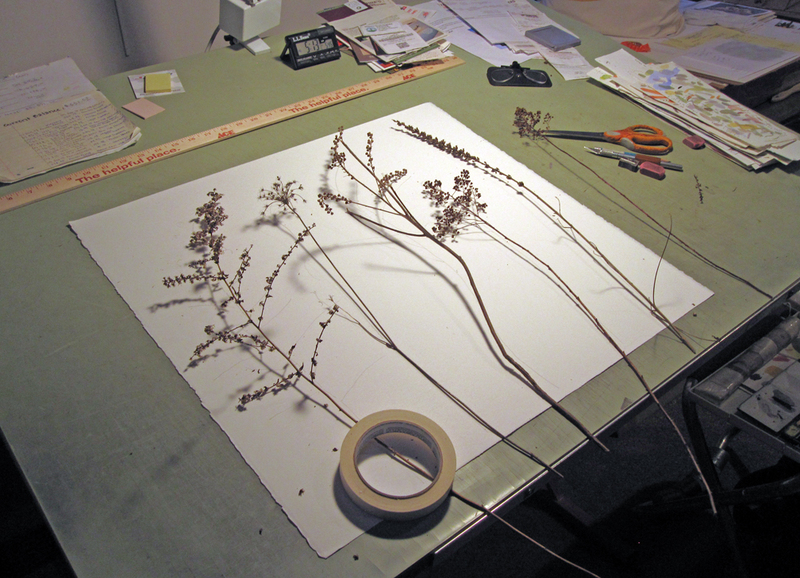 Before I leave, I again walk down to the cattail marsh – this time to collect some of the interesting “weeds” growing along the driveway. Visitors are discouraged from collecting natural materials at any of the Mass Audubon properties, so I discretely gather only a few stems, making sure to avoid any rare or unusual species. I’ll bring these back to the studio to paint in a warmer, more controlled environment (stay tuned for Part 2: Lost in the Weeds). This entry was posted in Artists, Barry Van Dusen Residency, News and tagged Barry Van Dusen, Beech leaf ballet, Cattail, chickadee, Endicott Wildlife Sanctuary, Ferns, Ipswich River Nature Preschool, lovely weeds, mossy hemlock gorge, red oak, swampy stream, White Pine on May 8, 2017 by Barry V..
Posted on July 10, 2015 by Barry V.
The mountain laurel is in full bloom as I hike up the Loop Trail at Flat Rock Wildlife Sanctuary in Fitchburg. I admire the many stately beech trees in the forest here, their smooth gray bark dappled with sunlight. Ovenbirds and towhees sing from the understory. 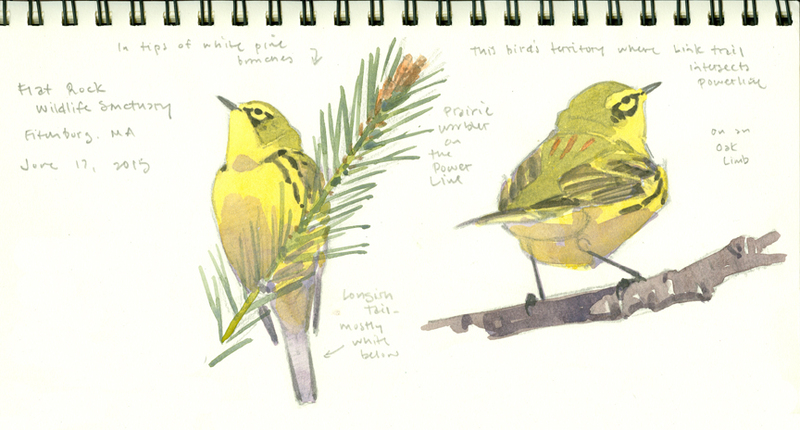 As I near the power lines on the Link Path, I hear the unmistakable song of a prairie warbler (certainly one of the easiest of the warbler songs to learn and remember). With gentle pishing sounds I lure the bird closer until it’s singing from the top of a white pine right above my head. 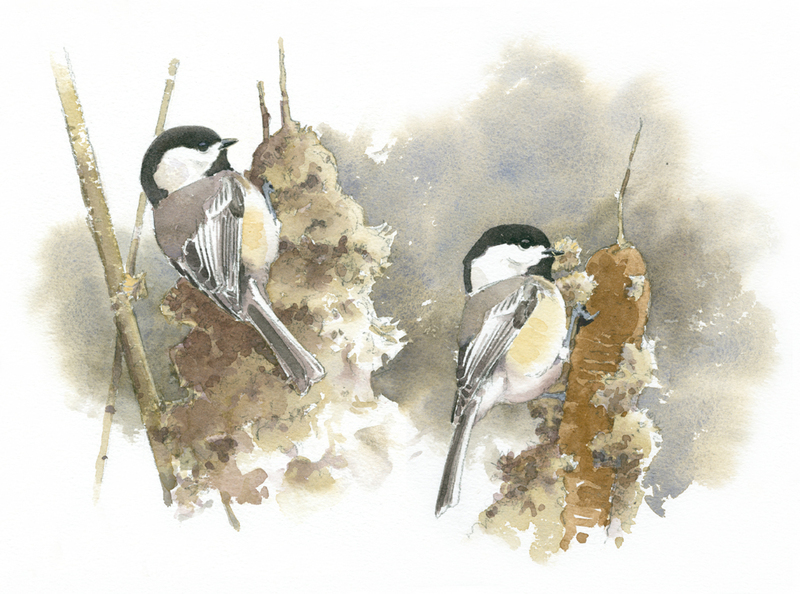 I sketch furiously as it moves to nearby oaks, singing all the while. Up on Flat Rock Road Trail the forest is drier and more spare, dominated by oaks and pines of moderate height, none very tall. The trail itself is bare bedrock. With every step my feet are in contact with the bones of the earth. Arriving at “The Bald”, I expect to get a view (as advertised on my trail map), but the trees have evidently grown up since the map was published, and no view is to be had, at least at this time of year. Looping back on the powerlines I pass several boggy depressions and notice a calico pennant perched on a short stalk. Dragonflies are good models for the field artist, since they choose a favorite perch from which to hunt, and return to it again and again. 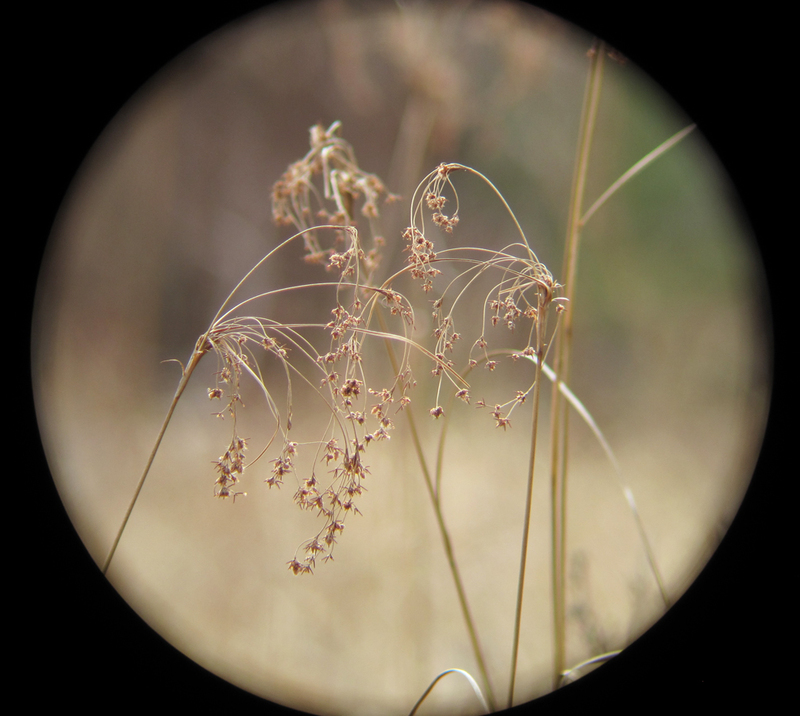 With my telescope, I can focus on that perch and be assured that the odonate will soon return. Back at the meadow next to the parking area I discover many more calico pennants, and decide to do a series of studies on a piece of hot-press watercolor paper. Curiously, none of the pennants are the bright red adult males. 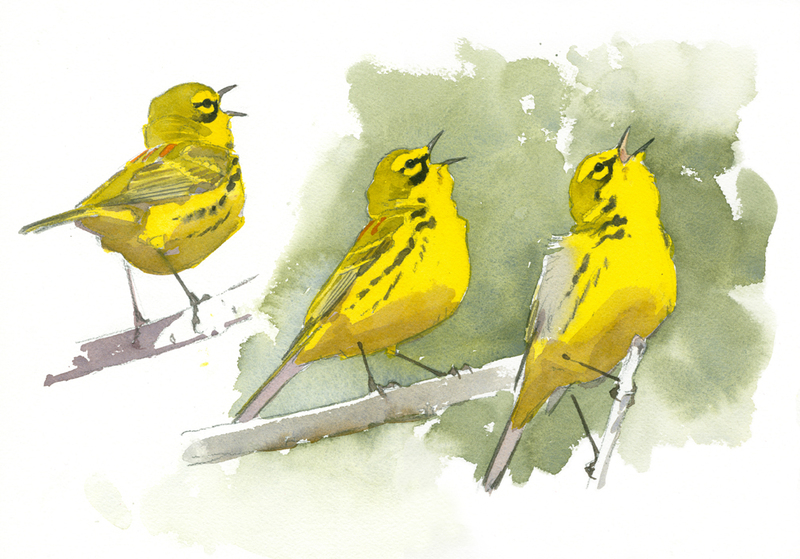 All the individuals I observe are yellow – identifying them as either young males or females. 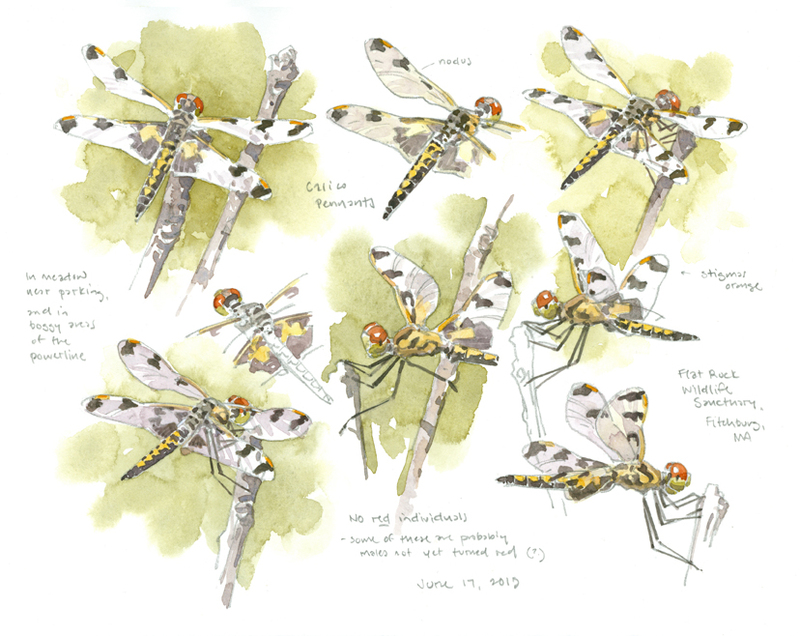 This entry was posted in Artists, Barry Van Dusen Residency, News and tagged Barry Van Dusen, Beech trees, Birds, Dragonflies, Dragonfly, Fitchburg, Fitchbury, Flat Rock Wildlife Sanctuary, Hot-press watercolor, Link Path, Ovenbirds, Pennants dragonfly, Prairie Warbler, Watercolors, White Pine, Wildlife Sanctuary on July 10, 2015 by Barry V..